Beleaguered prime minister George Papandreou chaired an emergency cabinet meeting in Athens, with his finance minister and some Socialist lawmakers in revolt, after France and Germany gave Greeks an ultimatum to make up their minds. French president Nicolas Sarkozy and German chancellor Angela Merkel told Papandreou at a torrid meeting in Cannes on Wednesday night that Athens would not receive a cent more in aid until it votes to meet its commitments to the euro zone. Greece was due a vital €8 billion instalment this month. The political turmoil in Greece and uncertainty over the euro zone sent stocks and commodity prices lower in Asia, and fuelled a rush into safe-haven German bonds. But financial markets rallied in nervous trading as the likelihood grew that Greece would not hold the highly risky referendum. The leaders of China, Russia and the United States pressed the Europeans to act swiftly to contain their sovereign debt crisis in comments before a summit of the Group of 20 major world economies in the French Riviera resort. “Europe should aid itself, the European Union has everything for that today -- the political authority, the financial resources and the backing of many countries," Russian President Dmitry Medvedev said. A senior G-20 official said the group was assessing the cost of a possible Greek default and looking at the implications if Athens were to leave the currency bloc. On his return to Athens from Cannes, finance minister Evangelos Venizelos broke ranks with Papandreou and said Greece’s euro membership was a historic achievement and “cannot depend on a referendum". More dissident lawmakers in the ruling PASOK party spoke out against a referendum and called for a national unity government or early elections, casting doubt on whether Papandreou would survive the week in office. Opposition leader Antonis Samaras, signalling a potential compromise, called for a transitional government to lead Greece to early elections and said the present parliament should first ratify last week’s €130 billion ($178 billion) EU bailout deal. Euro area leaders talked openly of a possible Greek exit from the 17-nation currency area, seeking to maximise pressure on Athens and preserve the euro in case of a “no" vote. Merkel told a midnight news conference that while she would prefer to stabilise the euro with Greece as a member, the top priority was saving the euro, not rescuing the Greeks. The chairman of euro zone finance ministers, Luxembourg prime minister Jean-Claude Juncker, said policymakers were working on possible scenarios for a Greek exit. “We are working on the subject of how to ensure there is not a disaster for the people in Germany, Luxembourg, the euro zone. We are absolutely prepared for the situation," Juncker told Germany’s ZDF television. France’s Europe minister, Jean Leonetti, said bluntly the euro could survive without Greece. “Greece is something we can get over, something we can live without," he told RTL radio in an interview. The spectre of a possible hard Greek default and euro exit hung over the G-20 summit, highlighting Europe’s frailty and divisions just when Sarkozy had hoped to showcase his leadership of the world’s major economies. “On the Greek issue, you have to assess all scenarios and the group is internally assessing the cost of an outright default. We hope we don’t get there," a senior G-20 source said. “Whether they will stay in the euro or outside is something the euro zone has to decide, but obviously the G-20 is concerned and is also trying to understand the impact and implications of a possible exit from the euro by Greece," he added. US president Barack Obama said after talks with Sarkozy that Europe had made some important steps towards a comprehensive solution to its sovereign debt crisis but needed to flesh out and implement the plan quickly. Leaders of the BRICS group of emerging economies -- Brazil, Russia, India, China and South Africa -- discussed the euro zone crisis at a separate meeting. The summit had been meant to focus on reforms of the global monetary system and steps to rein in speculative capital flows, but the shockwaves from Greece have upended the talks. Merkel and Sarkozy made clear that Athens would not receive an €8 billion aid tranche it desperately needs to avoid default until a referendum had passed. Should it fail, EU/IMF aid would end, plunging Greece into a disorderly default that would reverberate across the euro zone, potentially engulfing big economies like Italy and Spain. “Our Greek friends must decide whether they want to continue the journey with us," Sarkozy told reporters at a joint news conference with Merkel after the crisis talks. Germany, France, Italy, Spain and International Monetary Fund, European Central Bank and top EU officials met in Cannes on Thursday to explore ways of accelerating implementation of an anti-crisis package agreed on 27 October. That plan, which includes debt relief for Greece, a recapitalisation of European banks and a leveraging of the bloc’s rescue fund, the European Financial Stability Facility (EFSF), was meant to stem the two-year old crisis before Papandreou’s referendum call cast the bloc into turmoil again. The G-20 summit began with a working lunch on the world economy, likely to be dominated by Europe’s debt woes. 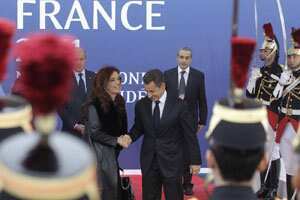 Sarkozy had hoped to use his presidency of the G-20 as a springboard for his own re-election campaign in 2012, setting ambitious goals including a rethink of the global monetary system and measures to fight commodity price volatility. But he has been forced to scale back expectations as crisis-fighting has taken priority over grand visions of world economic reform. 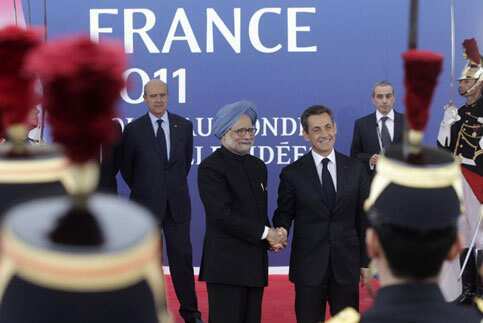 Sarkozy met Chinese president Hu Jintao on Wednesday as part of a European effort to convince the world’s emerging powers to help boost the firepower of the bloc’s bailout fund. But Hu said it was up to Europe to solve its debt woes, according to a Chinese foreign ministry statement. Doubts about Europe’s ability to contain the debt crisis has put Italy and Spain firmly in the firing line. The risk premium on Italian bonds over safe-haven German Bunds has hit euro-lifetime highs this week, despite European Central Bank buying of its bonds. Spain had to pay its highest yield since 2008 at a bond auction on Thursday. Italian prime minister Silvio Berlusconi has scrambled to come up with measures to placate markets, holding an emergency cabinet meeting to accelerate budget reforms amid mounting calls for his resignation.